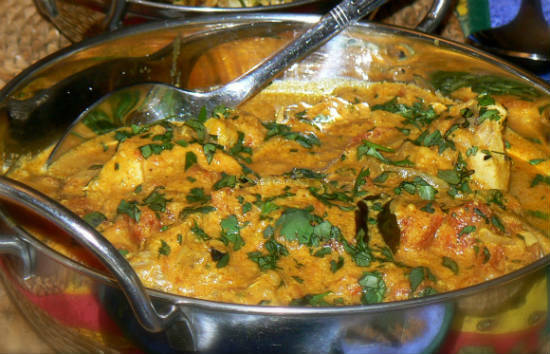 A delicious Chettinadu style Chicken Curry. Serve with hot rice. 2. Add the tempering ingredients and fry for a minute. 3. Add the chopped onions and saute until golden. 4. Add ginger garlic paste and stir well. 5. Simmer for 30 seconds and add the tomatoes. 6. Add the coriander leaves, red chilli powder, turmeric powder and pepper powder. 7. Mix well and add the chicken pieces. 8. Add salt and pour 1/2 cup of water. 9. Cover the pan with a lid and simmer for 5 minutes. 10. Remove the lid and stir once. Cover again and bring to a boil. 11. When the chicken is cooked and tender, sprinkle coriander leaves and pepper powder on top. 12. Stir to mix well. 13. Remove from flame and serve hot. Feel free to comment or share your thoughts on this Chettinad Chicken Curry Recipe from Awesome Cuisine.